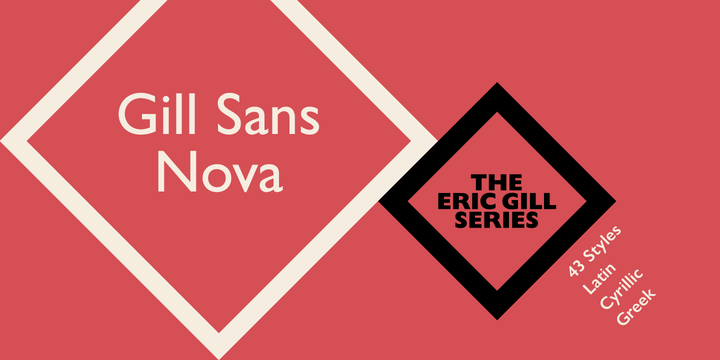 Gill Sans Nova is a very functional and powerful geometrical type created by George Ryan (inspired by Eric Gill‘s Gill Sans font) and published by the renown Monotype font foundry. Based on the Gill Sans, an immensely popular and historic font created by Eric Gill in the 1920’s, Gill Sans Nova extends the original from 18 to 43 fonts and combines a coordinated range of roman and condensed designs for authentic looks creating an impressive straight contrast to stand apart. Another instant classic is now available with the revival of Gill Sans as Gill Sans Nova! Note: Gill Sans Nova is a trademark font name of The Monotype Corporation. A font description published on Monday, November 23rd, 2015 in Eric Gill, Fonts, George Ryan, Monotype by Andrei that has 5,966 views.